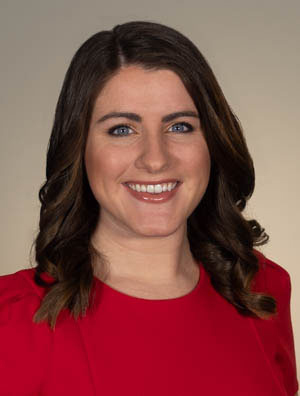 Emily Kennedy joined the ABC 57 First Warning Neighborhood Weather Team in March 2017. You can tune into the morning show to catch her forecasts on ABC 57 and the CW25 from 4:30 - 9 am every weekday. She is happy to be back home once again as she grew up in Michiana. She didn’t travel too far for college as she attended Valparaiso University, where she got her degree in Meteorology. Her love for weather began much earlier than college. She fondly remembers setting up her chair inside the garage to watch the thunderstorms go by and having her eyes glued to the TV when Storm Stories was on air. This passion was only fueled during her time at Valparaiso University when she was able to go on a 10 day storm chase across the Central Plains. Before coming back home to Michiana, Emily worked in Northern Michigan where she got her dose of everything from lake effect snow and winter storms to severe weather. A part from weather, Emily has a love for adventure. During her time up north, she went skydiving, kayaking and hiking. She cannot wait to see what new adventures await her here. Outside of work she enjoys crafting, spending time outdoors, checking out local breweries and wineries, traveling and much more. Emily loves being connected to the community. You can connect with her by following her on Facebook or Twitter. She can also be reached by e-mail at ekennedy@abc57.com. Rain Saturday turns mix/snow Sunday and very windy!